Earlier on in Rebecca's pregnancy, all she wanted to eat was potatoes. So, I started referring to the baby-to-be as 'the Potato'. 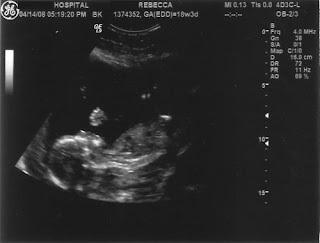 So, here is one of the ultrasound pics of the Potato. Careful what you call the baby. It might stick. Samuel was known as bagel for quite a while!